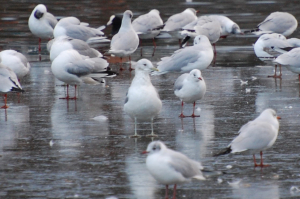 Observation - Common gull among black-headed gulls - UK and Ireland. Description: Medium sized gull, but bigger than the black-headed gull. Greenish legs and greyish yellow coloured bill. Medium sized gull, but bigger than the black-headed gull. Greenish legs and greyish yellow coloured bill.